one problem of setting up this page the way i have is that when joy-of-joys someone actually posts a comment, i usually can’t bear to post anything new because then that post moves to the past page and i have to start all over again. and, there’s also the chance (like a snowball in hell..) that someone seeing my post, plus someone else’s comment, may deign to comment themselves! lordy, that would be a virtual commenting revolution for this site.. so, usually, i would hold off and wait in vain and yet be very pleased to see that one shining comment all ready for others to click on. not this time, though. partially because amanda has increased my confidence with many a nice comment and, mostly, because it’s a dull-as-dirt friday, with most of the building, much less office, totally deserted. what’s a good girl to do? answer: 1) catch up with bloglines and 2) read as many different versions of your horoscope that you can find. finally catching up on my rss feeds that have been building up in bloglines (over 100 entries with some sites, yikes), i found this. 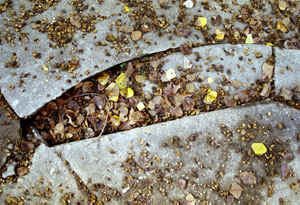 i love this picture ~ reminds me of sidewalks in big cities that are all cracking and upheaving due to roots of trees. nature rules all ~ like here and here. (trying to find photos of sidwalks cracking due to trees is really hard! i know i’ve seen much more dramatic examples than the two i found, maybe i’ll look around this weekend and try to find a few. heck, just looking out my office window i see one creat one from here. ok, i’ll do it and post some photos on tuesday.) now, i know that’s not the point of this photo, but when i look at it, it feels like the same creepy power of nature that i am so glad exists. i have xtc’s “dear god” song in my head, so good i can’t stand it. vacya introduced it to me the other day and since then i find myself humming it. maybe i’ll put it up as a streaming mp3, good idea?